A note on terminology: In Canada, the term “Aboriginal” is used to refer to all Native populations, including people who are either “First Nations (people of 100% native descent, affiliated with the 10 original provinces of the Canadian “south”), “Métis” (people who are part-Native, part-European), or Inuit and Dene (Native people who are from the Canadian “north,” i.e., Yukon, Northwest Territories, and Nunuvut). The term “First Peoples” can be used synonymously with Aboriginal. We have chosen to use the term Aboriginal rather than First Peoples to reduce confusion and because it is in keeping with the language used by our partners and hosts in Winnipeg. 5:00 pm Learning/Action Lab begins. Location for reception/dinner: River Salon at Inn at The Forks, 75 Forks Market Rd, Winnipeg, MB. 5:30 Reception and welcome: Greeting from Ted/Justin. 6:00 Dinner: Provided by the Learning/Action Lab. 8:30 Breakfast: Provided by the Learning/Action Lab. 9:30 Welcome: Brief welcome from host, review of agenda, general housekeeping, led by Marjorie Kelly and Ted Howard. Julie Harper, Education and Cooperative Coordinator, Eagle Women’s Lodge at the Native Women’s Transition Centre Inc.
11:00 Breakout session with panelists: Self-organize into peer groups for direct engagement with panelists as an opportunity to deeply engage around shared challenges. 12:30 Lunch at Neechi Food Cooperative and Commons (http://neechi.ca/), 865 Main St, Winnipeg, MB: Neechi Food Cooperatives (Neechi means friend/sister/brother in Cree and Ojibwa) is an Aboriginal grocery and specialty store that opened in Winnipeg in 1990. It is truly a community store, based on the principles of an Aboriginal owned-and-operated worker co-operative. The new Neechi Commons offers a neighborhood supermarket, restaurant, fruit and vegetable courtyard and arts store. During our visit, in addition to a delicious lunch in their restaurant, we will have a conversation about their operations and economic development activities and learn about what it takes to do this work in First Nations communities. 2:15 Tour of and presentation at SEED Winnipeg (http://seedwinnipeg.ca/), 80 Salter St, Winnipeg, MB: (Moderator: Marjorie Kelly) Down the street from Neechi Commons, SEED Winnipeg offers asset building and cooperative development services to Aboriginal residents in the city. Together with the University of Winnipeg’s Community Renewal Corporation (UWCRC) they run Diversity Food Services, a social enterprise that provides food services to the University of Winnipeg and to the community while providing job opportunities for immigrants, people of Aboriginal descent, and others who are “hard-to-employ.” During our visit we will hear from Sherman Kreiner, Managing Director of UWCRC, and Cindy Coker, Executive Director, SEED Winnipeg, as well as a representative and employees from Diversity Foods, and participants in the business development programs offered by UWCRC. 4:30 Refreshments at Arctic Cooperatives (http://www.arcticco-op.com/), 1645 Inkster Blvd, Winnipeg, MB: Incorporated in 1972, Arctic Cooperatives provides support to a network of cooperative business enterprises that are located in Nunavut and Northwest Territories, with combined revenues of approximately $196.7 million in 2012. With over 900 people employed in the network, the co-op system in the north is a great example of Aboriginal community economic development in Canada. The 31 co-ops are independently owned and controlled Inuit and Dene businesses. Businesses include retail facilities, hotels, cable operations, construction, outfitting, arts and crafts production and property rentals. At Arctic’s offices, Andy Morrison, CEO, will greet us, along with other staff, while we view Inuit and Dene art and enjoy light refreshments. 5:30 Return to Hotel: Dinner on your own. 8:30am Breakfast: Provided by the Learning Action Lab at hotel using meal vouchers. 11:30 Lunch with Urban Circle. Provided by Learning/Action Lab. 12:15pm Return to meeting location. 12:30 Moving in to Year Two: (Moderator: Ted Howard) Brief discussion about where we are in the proposal process, next steps for the project overall, and what year 2 will look like. 2:00 Closing Circle: Report back and feedback. Winnipeg James Armstrong Richardson Airport (YWG) is the only airport that serves the city and is about a half hour away from downtown Winnipeg and The Forks. The best way to get to and from the airport is by taxi or sedan services. The cost to downtown is roughly $18 in a taxi or $32 in a sedan. The airport is also serviced by Winnipeg’s extensive public bus system but takes closer to an hour and requires at least one transfer to get to and from the hotel where we will be staying. The cost for a one-way fare is under $3. To get exact fares and find out the best bus route, visit: https://winnipegtransit.com/. Since we will be traveling across international borders to get in to Canada, not only is a passport required, but you will also have to clear customs entering Canada and when returning to the United States. For more about what you can bring in to Canada and bring back in to the United States, visit this website: http://canada.usembassy.gov/traveling_to_canada/entering-canada.html. Because of customs and security clearance it is best to allow yourself more time at the airport – arriving 2 hours in advance of your flight is what is recommended for international travel. Canada uses the Canadian Dollar rather than the American Dollar and they have different values. As of May 8 2014, 1 Canadian Dollar was equal 92 cents US. Please be aware that sales tax in Canada is high. Expect to add 13 percent to the bills of most everything that you buy. To buy goods and services in Winnipeg, you will have to exchange U.S. dollars for Canadian dollars or withdraw money from an ATM in Canada to pay with cash and you will most likely be charged a minimal conversion fee by your bank when using a debit or credit card (which are accepted most places that they are accepted in the United States). If you do not regularly travel outside of the United States, it is advisable to call your bank in advance so that they do not put a freeze on your card for fear of suspicious activity. We have set aside a block of rooms for our whole group at the Inn at the Forks on the national historic site of The Forks in downtown Winnipeg. Our opening reception and dinner on Monday, May 19 starting at 5pm will be held in the River Salon on the second floor of the hotel. Our meetings on the morning of Tuesday, May 20 and the afternoon of Wednesday, May 21 will be held at the Manitoba Theatre for Young People, right next door to the hotel. It is a colorful contemporary building on an intersection diagonally across the street from the “Explore Manitoba” building. The area of The Forks, where our hotel and meeting space are, is one of Winnipeg’s most popular tourist attractions with many parks, restaurants, museums and shops. Located at the junction of the Assiniboine and Red rivers, The Forks was originally a trading post for early Aboriginals and, later, European fur traders and riverboat workers, railway pioneers and other immigrants. 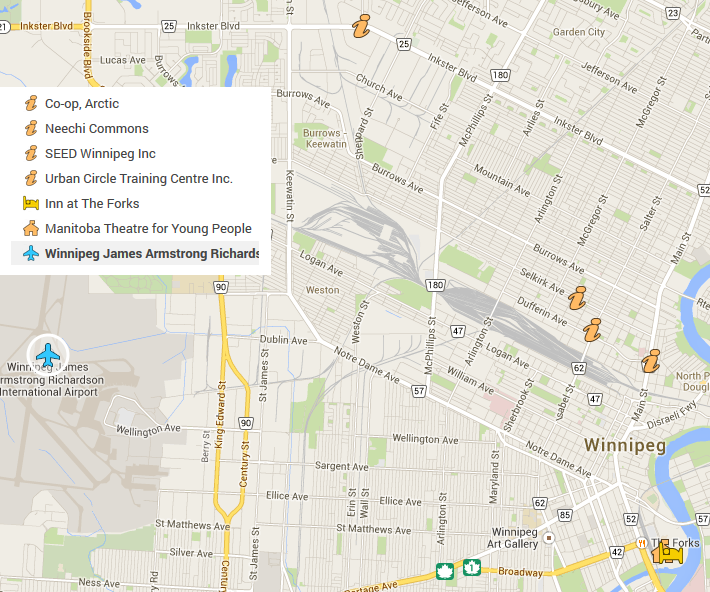 It is not far from the downtown Winnipeg business district. You can find out more about The Forks at http://www.theforks.com/. We will visit three locations on Tuesday afternoon starting shortly after 12 noon and returning to the hotel by 6 pm. We will also be spending Wednesday morning from 9 am until shortly after noon at yet another location (please see the agenda for more details). A bus will be provided for all visits. We will mostly be going to organization’s offices and meeting spaces, but we will also be visiting a grocery store and doing some short walking tours, so dress comfortably and wear shoes that are good for walking. Please note that as participants in the Learning/Action Lab you are responsible for your own hotel, transportation, and food costs. As part of the Lab, the sponsors will be providing certain meals (as specified on the Agenda) and paying for these. Other food costs are your responsibility. Winnipeg has very harsh, cold and snowy winters and a late spring, with temperatures usually between 5 and 10 degrees colder than Northern U.S. cities such as Minneapolis, MN. Please be sure to check the weather in advance, but at the moment the forecast for our time there shows highs in the mid-50s to low-60s with lows in the 40s with some chance of precipitation. Be sure to bring layers and dress accordingly. Winnipeg has an extensive network of public buses, operated by Winnipeg Transit. Fares are generally under $3 to go anywhere within the city and free transfers are available. You can purchase a book of ten tickets for just over $20. Winnipeg Transit also offers a free downtown Spirit Shuttle bus that covers Portage Avenue, Broadway, and the Forks. You can find maps, hour, determine fares, and plan routes for both the bus system and the free shuttle at https://winnipegtransit.com/. Please note: A Map of The Forks with a list of restaurants and sites is available for free at the front desk of the Inn at the Forks.